Did you know you can make a concrete stool or plant stand for only $5? I didn’t either until one day awhile back I browsing Pinterest and came across this video. I was in love! 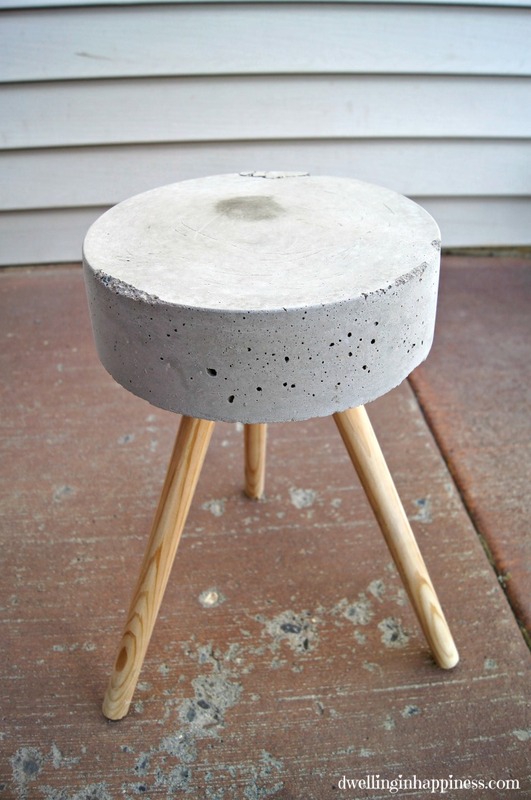 I had NO idea you could make a fun little stool with just a bag of concrete, a bucket, and a dowel. Oh Pinterest, how you never cease to amaze me. 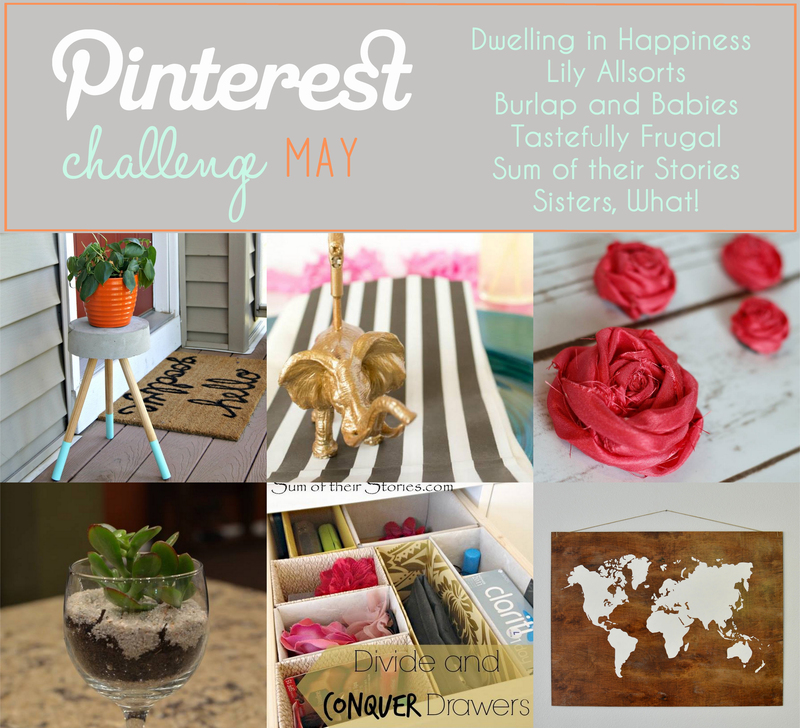 So for May’s Pinterest Challenge, I just knew I had to make my own! We didn’t really need any stools though, but I did need something to go on my front porch to hold a potted plant. 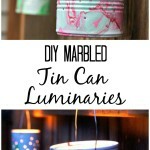 If you want to make your own, it seriously IS as easy as the video shows. 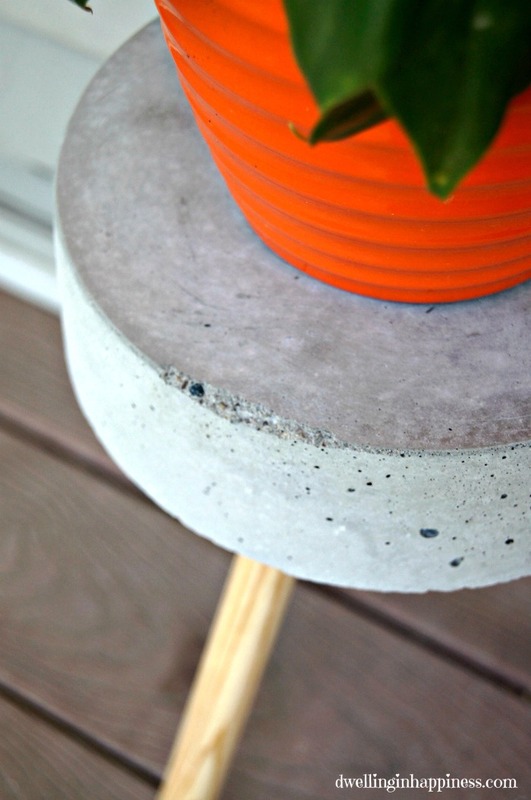 To make this adorable little DIY concrete plant stand, start by measuring and cutting your dowel into thirds (each leg was 16″ long). 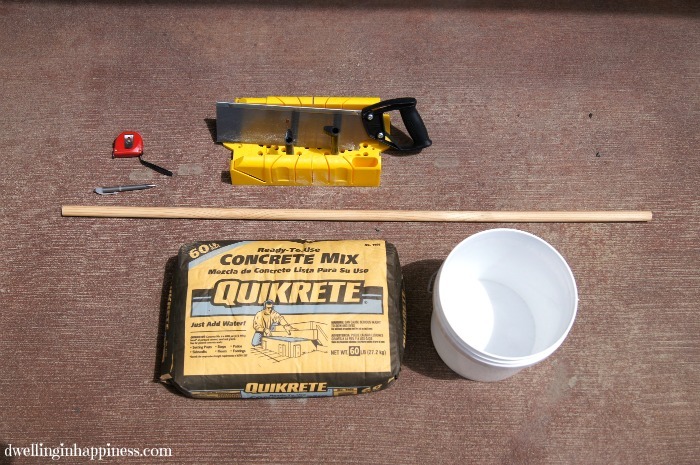 Cut a hole in your concrete bag, and scoop out a cupful or two into your bucket. 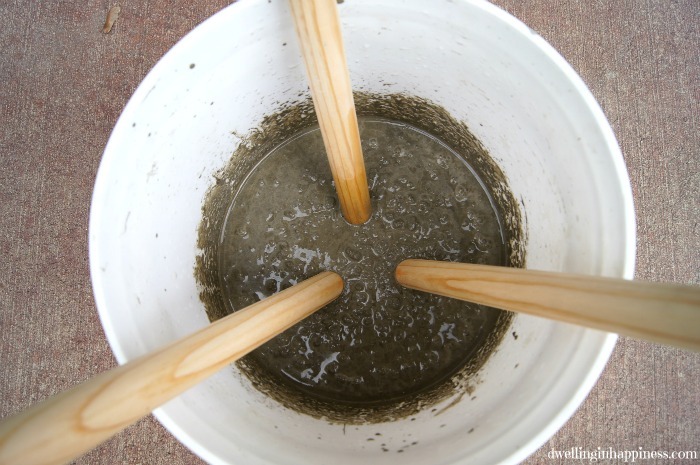 Add a little bit of water and use a dowel to stir. I know “add a little bit of water” is vague, but we really didn’t measure anything out. We just kept adding little bits of water until we thought the consistency was just right; not too liquid-y, but liquid enough that the dowel legs sunk in easily. 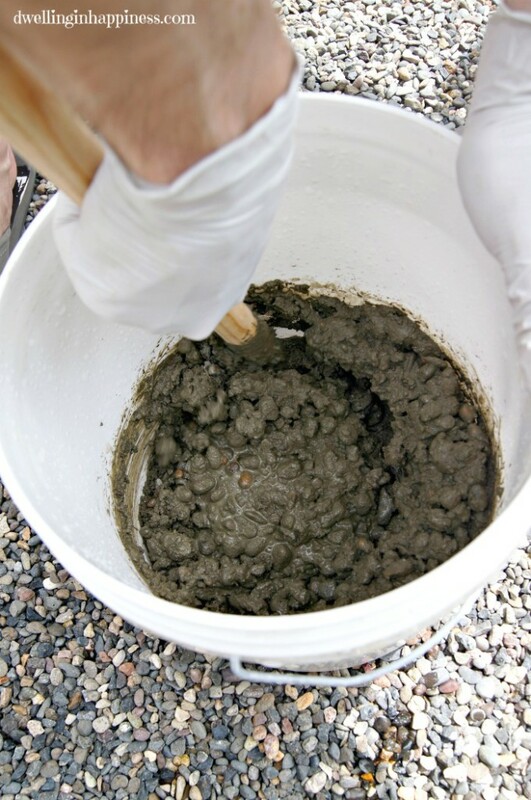 Make sure to mix your concrete really well. 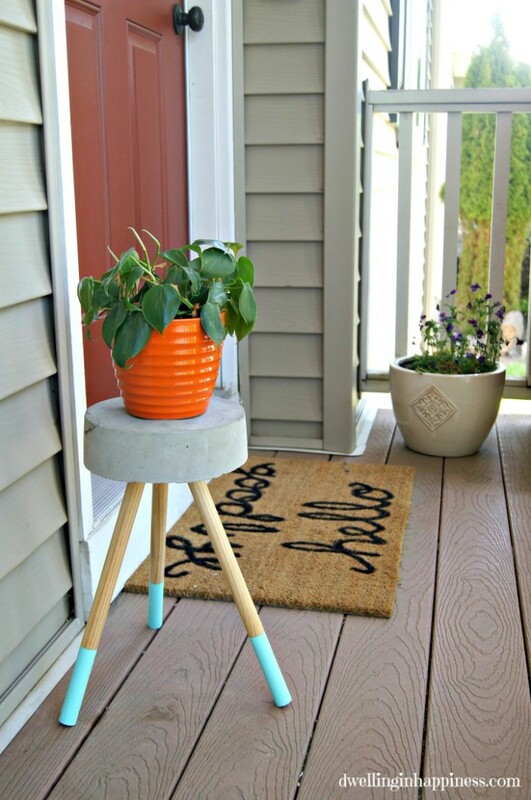 We made ours a couple of inches thick, but you can use less concrete and water to make your “stool” or plant stand not so thick. 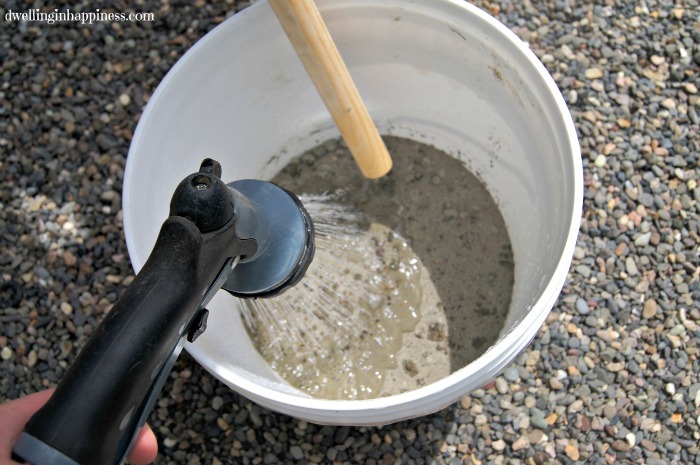 Use another dowel to gently tap the bucket and get out all the air bubbles. Do this for at least 30 seconds, or until you no longer see bubbles pop on top of the concrete. 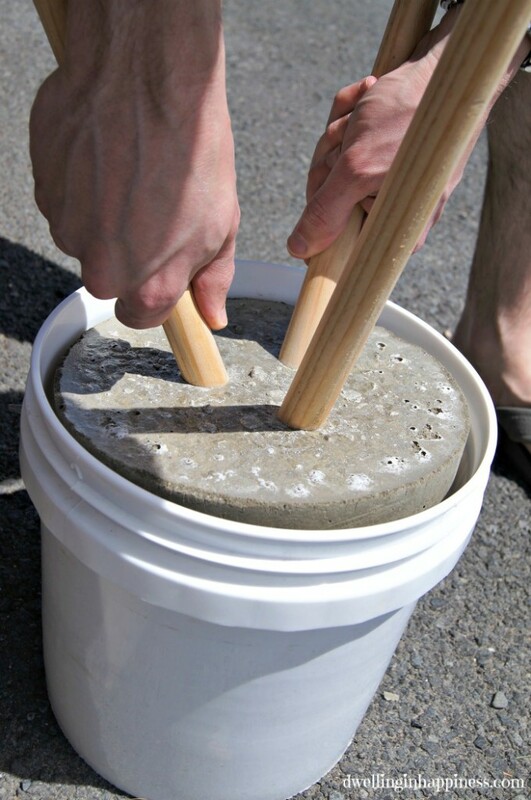 Now rinse off your dowel and carefully push all 3 dowels in the concrete. We were worried our dowels wouldn’t end up being level and our plant stand would be awkwardly leaning to one side, but it wasn’t at all! Don’t worry too much about how level they are, just make sure they are equal distances apart (think thirds!). 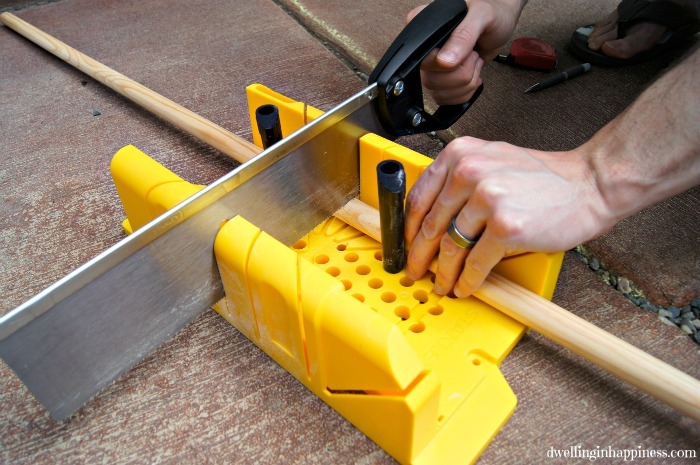 Once your dowels are set, make sure it dries for at least 20 hours on a leveled surface. 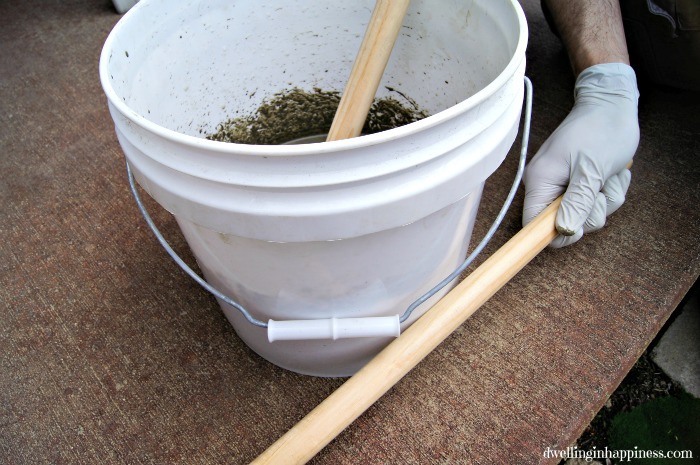 When dry, bend the bucket outwards a few times to loosen the concrete. We made the mistake of using the legs to twist the concrete back and forth in the bucket, and unfortunately a few little concrete pieces fell off. However, I was able to just glue them back on later! Carefully lift the stool out of the bucket. If your edges are rough, you can smooth them out with some sandpaper, but I liked the look of mine the way it was. Woohoo! 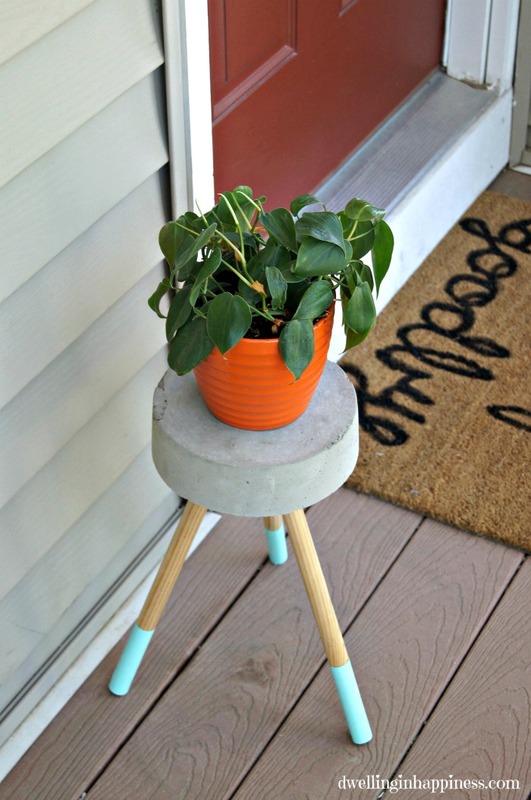 You totally just succeeded in making the cutest little plant stand/stool ever! It may not be completely dry yet and may take several more hours for any dark spots in the middle to disappear. Painting the legs is totally optional, but I wanted to add a cheery color to the bottoms. I measured and taped 4 inches up the legs and painted with an aqua acrylic paint. I might need to seal it later, since it’ll most likely get a little wet out on my porch. If you’re wanting to make a stool you can sit on, I’d recommend using a 5 gallon bucket and thicker dowels to hold a person’s weight. I just wanted a mini plant stand, so my 2 gallon bucket and thinner dowel worked just fine. I can’t get over how cute it looks next to my front door, AND next to my adorable little DIY hello/goodbye doormat! Ahh! 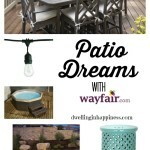 Perfect little addition to our front porch for the summer! If you want to check out some more fun Pinterest-inspired projects, then hop around to these fabulous blogger’s pages below! Wow, that’s fab! 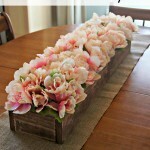 I love how you could make these any size and any height really easily. The splash of colour on the end of the legs is just a perfect finishing touch. I cannot find the hello goodbye doormat tutorial.it keeps saying page error. Ah Karen I’m sorry! I’m noticing the link isn’t working, either. I’ll get working on fixing it, thank you for letting me know! Your porch is looking rather nice! 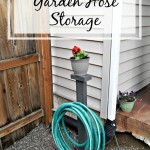 I love concrete projects and wow this one is inexpensive, easy and just so cute! Love! Thanks for sharing!! Thank you, Carrie! Me too, concrete projects are SO fun! I have another one I’m working on, too. 🙂 I just love how cheap it is, and how far it goes! Thanks for stopping by, friend, hope your weekend is going great! Love it!! And that mat is seriously awesome!! Thank you, friend! 🙂 Hope you’re enjoying your weekend! 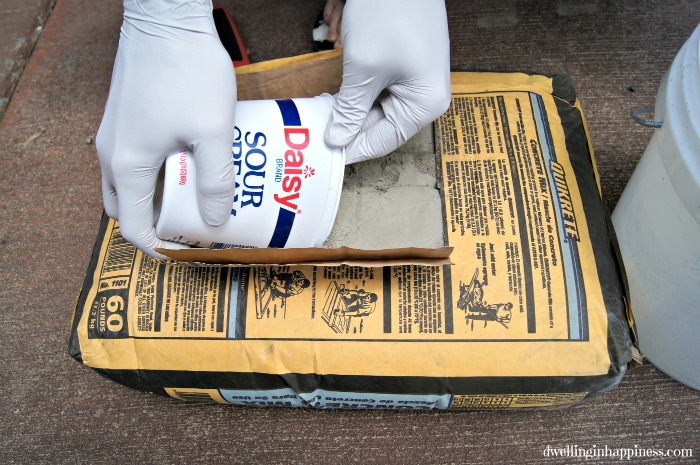 Oh my goodness, I’m amazed at all the cool projects people do with concrete, I’m definitely adding this to my list. This is lovely, Amanda! Love how it turned out! Thank you, Tara! It sure was a fun experiment that actually came out cute! 🙂 Happy weekend! I just love this! I can’t believe it only cost $5!! Thank you, Roxanne!! I love cheap projects that actually turn out. 😉 Hope your weekend is going great! This is so cool Amanda, I love it!!! Thanks so much, Emma! 🙂 Hope your weekend was great! 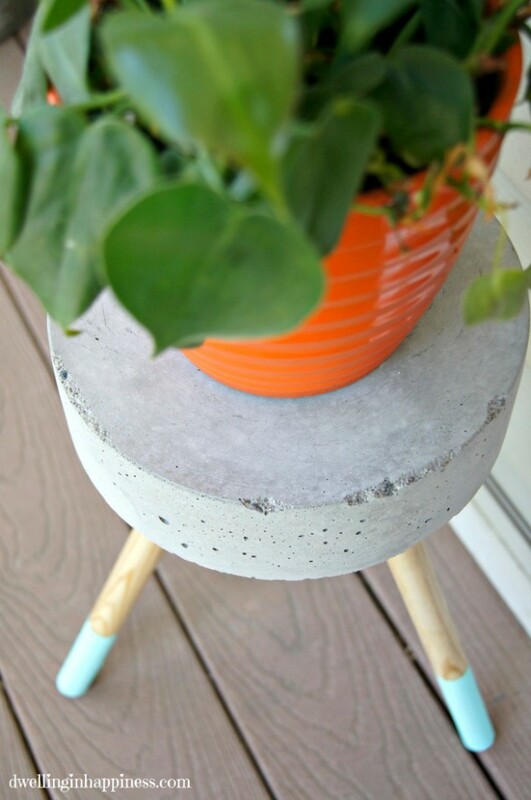 Projects with concrete always call my name…..I have a feeling I’d totally mess up the actual concrete portion of this project, but I’d love to buy something like this! The painted tips of the legs really make this stool/plant stand something unique. And I never got a chance to comment before, but I ADORE that doormat you made! This is such a great idea, Amanda! Love how you coloured part of the legs.. Looks beautiful on your porch! This is so cute and unique. Love the little aqua legs! garden board and Front Porch board. Great job! Love your project! 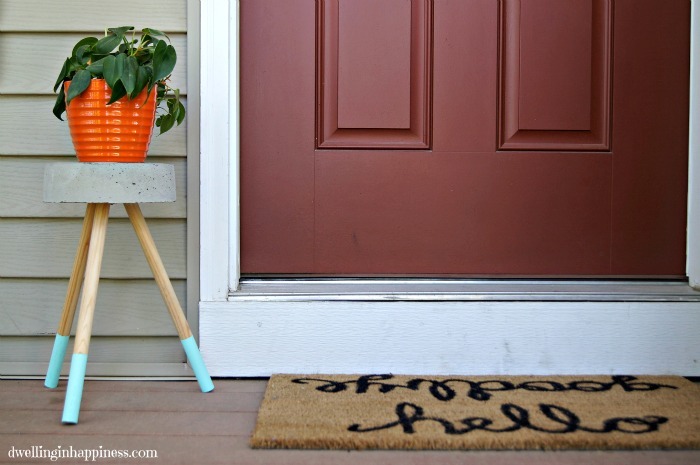 This is such a cute & contemporary way to update a planter ! 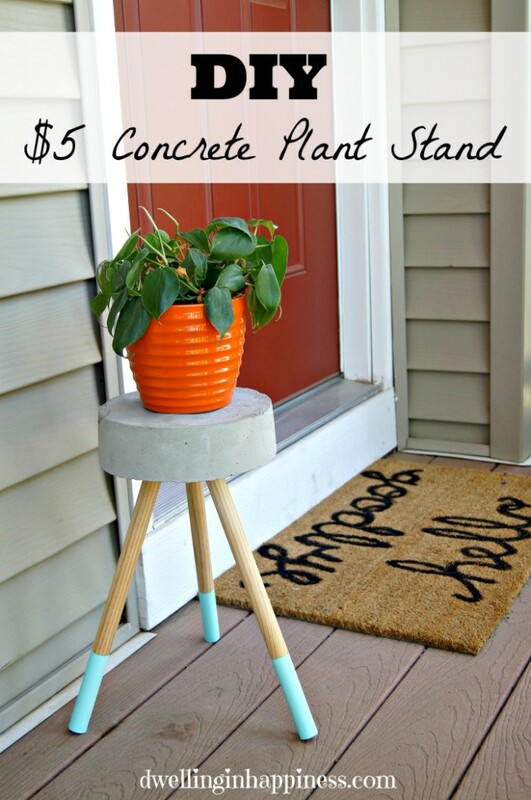 This is such a cute little stool/plant stand! I really like the dipped legs! I’ve seen this tutorial before and I always wondered about the legs being level too! It nice to know that it isn’t a concern! Thank you so much! I will be there to party, thanks! Have a great week! I love this!!! 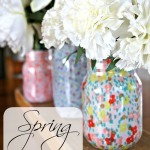 I can’t wait to share this and make some of my own for the next house! Aw thank you so much, Karisa! You’re so sweet! Hope you’re having a fab week, girl! Oh my gosh! This is the cutest thing ever. I just lOVE it! Great Ideal ! thanks for taking the time to share it. The first couple I made came out perfect, it’s a wonderful diy! 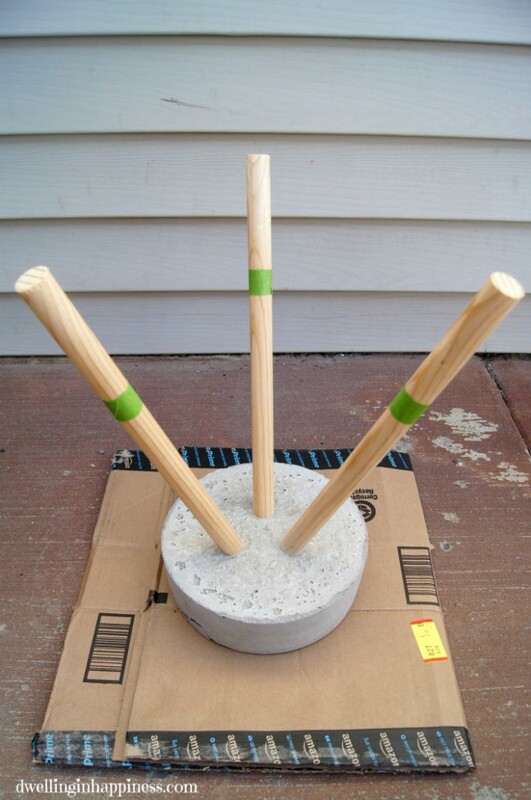 But I’ve been trying to make a couple more and the concrete keeps immediately breaking the first time I stretch the bucket to start to try and pull it out after 24 hours, do you have any idea what could be causing this?? Hi Laura! Hm, it could possibly do with temperature while it’s drying? I’ve only made one so I’m not totally sure unfortunately! Maybe let it dry for a little longer, too? Let me know if you figure it out! Hi, Can you also spray like cooking oil for it to come out smooth? And do you think metal legs would work just as well? Looks great!